How many boys and girls dream to become one day a model? You know that to become a model you have to complete some criteria, like you must be tall, beautiful and skinny, but even you don’t have all these don’t be discouraged, there are different ways to work as a model, not only being part of catwalks or runways. Anyway if you feel that this will be your career, you must start by consulting and be part of a Modeling Agency. A modeling agency is a company that works for fashion industry and represents fashion models. These agencies train their models and they invest money to increase their talent. In this way they get a good reputation and status in fashion industry, and are more likely to get deals with famous fashion designers, photographers or advertising agencies. From these deals they get their profit. It’s like other employment agencies but these are more specific, only for models and fashion industry. The most known modeling agencies have offices in the most important cities of fashion like London, Milan, Paris and New York. Elite is the most famous agency that has first opened in New York in 1977 and today manages over 800 models around the world. It has its offices also in London, Paris and Milan. It is a leader in creating Supermodels, thanks to its standards, professionalism and perseverance. Its experience and knowledge about fashion world helps on developing talented Top Models to an international level. It currently represents the most known Models like: Cindy Crawford, Gisele Bundchen, Tyra Banks, Alyssa Miller etc. It has contracts with leading fashion houses like: Victoria’s Secret, Prada, Louis Vuitton and Versace. Ford Models agency is located in New York but represents fashion talent around the world. 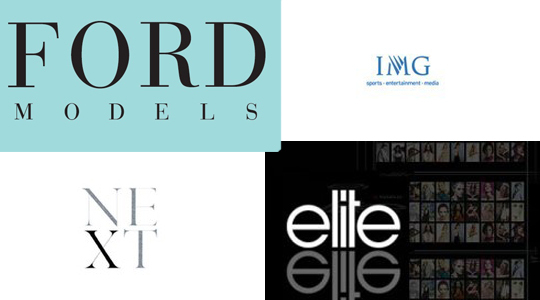 This agency includes famous names of Super Models (women or men), stylists, photographers and hair & makeup artists. It’s a respected name and professional, a good opportunity to start a Model career. From New York to London, Milan to Paris, IMG agency represents some of the today’s most famous supermodels. IMG clients are prestigious advertising campaigns, chic fashion houses, celebrities for fashion publications, movie screens or television. The most known names are Heidi Klum, Gisele Bundchen, Candice Swanepoel, Laetitia Casta and Lara Stone. Next Model is a global agency, one of the most successful fashion management agencies. It was first opened in New York in 1989 but today it has offices in Paris, Milan, Miami, London and in Canada. Every day a team works around the world looking for talented, new models, “New Faces”, develop them and build a long lasting career. It represents some of the iconic supermodels as Ania Rubik, Isabelli Fontana,Meghan Collison etc also it represents celebrities and special talents like Rita Ora, Jessica Alba, Jessie J and Lana Del Rei. This fashion agency is a leader thanks to energy, creativity, new ideas and relationships. An ambitious management by David Bonnouvrier results in an influential and powerful Modeling Agency for male models. It brings talented guys to become Supermodels, make contracts, deals for ad campaigns, runway or photo shooting. Also known for being a “Boutique Agency”, it has its roots in New York, created by Lana Winters in 2001. Having clear ideas of what works and what not, this agency approach models hopes and carefully works with them to ensure success. It is dedicated a special attention and time to each model, working hard with them but always with a benefit. This agency is special on how it works with models and focused on their careers. It represents about 75 both women and men models. Jordan Richardson, Nick Snider, Anderson Noel etc are some of the models created by Lana Winters, responsible of VNY Agency. Also are model agencies famous for male and female models around the world. Most known as said above, are Elite, Ford Models, Next, IGM etc with offices in the top fashion cities, London, New York, Milan and Paris but also in other countries around the world. Trust your name and your career to one of these agencies and your success will be guaranteed.